The parotid glands are two large salivary glands that lie just in front of and below your ear on either side of your face. is responsible for all the movements of the face. The most common problem is a small growth within the gland itself. These growths are usually non-cancerous but can, if left alone, grow larger and cause problems. For this reason, your doctor will often recommend an operation to remove the lump. 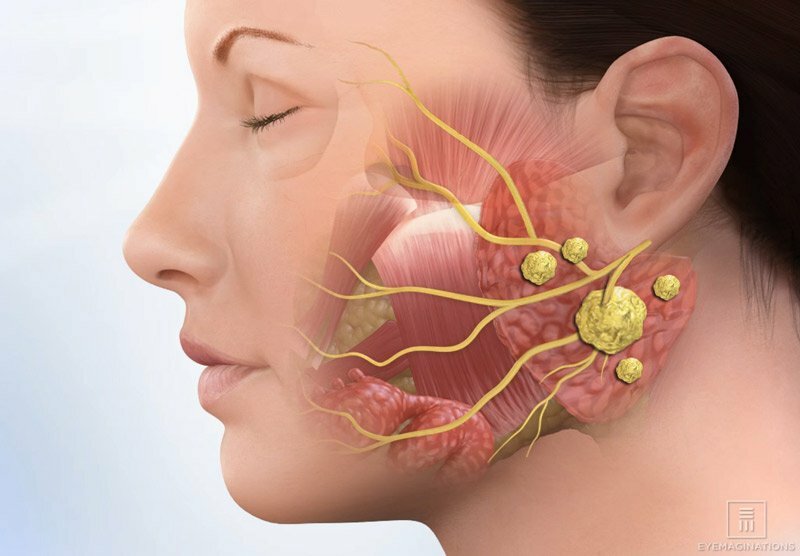 The only other common problem found in the parotid gland is recurrent infections often due to little stones forming within the ducts of the gland. If this problem is sufficiently troublesome, then again your doctor may recommend that the gland is removed to prevent the infections. You will attend the hospital about 1 – 2 weeks before the operation for a pre-operative assessment. You should not have suffered from a common cold for at least two weeks before the operation. If you have had a cold please ring the Consultant’s secretary. Please advise us if you take the oral contraceptive pill, as this may need to be stopped temporarily. You will be admitted to hospital on the morning of the surgery. a straightforward job to remove part of, or the entire gland, as required. to remove any blood that might collect and the incision is closed (often with special staples). The next day the plastic drain will be removed and if all is well you should be able to go home. Occasionally a second night in hospital is required. After leaving hospital the main problem is normally related to the length of operation and anaesthetic. People often feel tired and worn out for a few days afterwards until things get back to normal. The side of the face around the operation is often a little bruised and swollen and will certainly feel numb for quite some time afterwards. Occasionally there may be a little weakness of this side of the face because of some bruising around the facial nerve. The stitches or skin staples that have been used to close the incision should be removed about one week after the surgery. This can normally be arranged with your doctor’s surgery. A follow-up outpatient appointment will be made for four weeks after the surgery. Finally, we would recommend you allow at least two weeks for convalescence before getting back to normal activities. A medical certificate can be supplied if needed. As with all operations there is a risk of bleeding or infection, although these are uncommon in this operation. The main specific risk is damage to the facial nerve which can leave a temporary or permanent paralysis of your face. The risk of this occurring is very small. a problem but occasionally it can be troublesome and further treatment may be required for it. Finally, it is worth noting that although the numbness in the side of the face will largely disappear, there will always be some slight numbness of the ear lobe on the side of the operation as a result of having to cut one of the small nerves that supplies sensation to the ear. An incision is made in front of the ear extending to the neck. The facial nerve trunk and its branches are identified. The superficial or deep part of the gland is removed. Do I need to take time off work? Depending on the nature of your work it may be necessary to take a fortnight or so off work and avoid strenuous exercise for this time. It is important to remember that you will not be able to drive or operate machinery for 48 hours after your general anaesthetic. Will I need further appointments? A review appointment will be arranged before you leave hospital. Follow-up will be required depending on the diagnosis.